This week deputy foreign ministers of Iran, Azerbaijan, Russia, Kazakhstan and Turkmenistan held their 47th meeting (the so-called Working Group on Determining the Legal Status of the Caspian Sea). As expected, still no concrete result. The following article of mine (originally appeared in September 2016 issue of Energy Policy Turkey magazine, available at http://energypolicyturkey.com/wp-content/uploads/ekim/FLASH/index.html, for footnotes please see the original article) gives an overview why it is so. The Caspian Sea, the largest landlocked body of salty water in the world, is surrounded by five “Caspian States”: Russia in the north; Iran in the south; Azerbaijan in the west, and Kazakhstan and Turkmenistan in the east. Caspian Sea’s location at the crossroads of Asia, Europe, and the Middle East has kept the region’s strategic importance to international geopolitics. Before the breakup of the Soviet Union in 1991, Soviet-Iran treaties governed the exploitation of the Caspian Sea, but since then a legislative black hole in governance and delimitation has been created. All littoral states agree that a multilateral treaty is the ideal way to resolve their dispute over the division of the sea bottom and the delimitation of surface waters. There are great difficulties in resolving this issue since even international laws fail to provide an adequate framework. All the treaties in the past relate to navigation and, to a lesser extent, fishing rights, but not to seabed mining. Navigation and fishing rights should not be confused with the right of using the mineral resources. With mineral resources, the seabed is taken to consideration and not the water layer. Failed consensus due to diverse motives and interests paved the way for unilateral actions, bilateral and trilateral agreements,[iii] and consequent disputes. The legal headache of dividing up the sea continues to pose a serious obstacle to the development of several fields and blocked many projects including trans-Caspian oil and gas pipelines. After all, how the Caspian seabed is divided among the littoral states will determine which hydrocarbon fields will fall into whose sector. Any investigation about the legal framework of the Caspian Sea should make distinction between legal status and legal regime. While the legal status, whether a particular body of water is a lake or a sea, relates to the sovereignty, the legal regime relates to using rights and obligations. In the absence of a definitive determination of such regime the Caspian Sea legal status will continue to be discussed with no end. First, the real headache is the division of natural resources under the seabed and laying pipelines on it. But there has never been an agreement accepted by all the littoral states on these issues in the past. Second, which international law would be the reference? Since the name of the Caspian is still not legally set as sea or lake, no international law is applicable. Although, the weight of historical evidence indicates the Caspian rather as an international lake, it is neither a sea nor a lake. Therefore, neither the international law of the sea nor the law of inland lakes applies directly to it. Third, even if we set the name today its legal regime needs to be solved according to the international law which existed at the time of the problem. Forth, how can an unsolved problem in the past between two parties (Russia and Iran) be solved today with three additional parties? Sixth, the 1982 UN Convention on the Law of the Sea (UNCLOS) provisions regarding enclosed or semi-enclosed seas are not regarded as part of customary international law. Seventh, the Caspian Sea does not fall clearly under the definition of enclosed, semi-enclosed, or open seas as set out in Articles 1, 2, and 122 of UNCLOS. By the way, except for Russia none of the Caspian littoral states ratified that Convention. Eight, application of UNCLOS to the Caspian Sea would also be complicated by the sea’s dimensions. Ninth, the entire Iran-USSR land boundary on both sides of the Caspian Sea was delimited by the agreements concluded in the mid-1950s. The 1954 Iran-USSR Agreement defined an administrative borderline (the so-called Astara-Hasankuli line[v]) between the USSR and Iran on the Western and Eastern side of the Sea. However, no provisions were made to demarcate the Caspian Sea. Interestingly, the aviation agreement concluded in 1964 between the two countries upheld this imaginary line for determining the flight information region as the marine border. Tenth, in the early 1970s, the Soviet Ministry for Oil and Gas Industry divided the north of the Astara-Hasankuli line into four regional sectors by utilizing the modified median line principle: Russia, Azerbaijan, Kazakhstan and Turkmenistan. These Republics were also granted the right to develop the fields in their own sectors. However, this had a mere administrative value and could not be interpreted as awarding the republics any proprietary rights, since according to the Soviet constitutions exclusive ownership of all natural resources belonged to the Union. In fact, it is because of many unique features that the Caspian Sea may need a special framework that would define its legal status and regime. This, however, would depend entirely on the unanimous agreement of all littoral states. The littoral states have their own interpretations and views on the demarcation of the Caspian Sea. Kazakhstan and Azerbaijan were in favour of the complete division (seabed or subsoil, water layer and air space) by applying the UN Convention on the Law of the Sea of 1982 to the Caspian Sea. Russia and Iran wanted the Caspian Sea to remain a shared sea (except for 10-mile coastal zones), in which all littoral states would be equally entitled to make use of both its waters and its seabed. When its proposal for joint control over the entire Caspian by all littoral states was not accepted, Iran suggested dividing the Caspian Sea into five equal parts regardless of the length of the coastal line of each state. This means, Iran has always defended the legal status of a lake. After offshore discoveries in its territorial waters Russia has changed or modified its opinion and has started to defend the idea of joint ownership in the undivided water layer and dividing the seabed (and the oil and gas resources underneath) into national sectors through a modified median line. This new proposal of Russia has been supported by Azerbaijan and Kazakhstan. Turkmenistan, meanwhile, has been holding a swinging and variable stance. Source: Eugene Petrov and Nikolay Amelin (2015). Gaining a Regional Perspective Caspian. GEO ExPro. Vol. 10, No. 5. In reality the issue is not only the partitioning of the Sea itself but also partitioning the multiple interests involved. The position of Azerbaijan, Kazakhstan and Turkmenistan has been driven first by commercial then political considerations. The positions of Iran and Russia indeed involve greater political and security components than the commercial. This is because they have much larger reserves outside the Caspian Sea. Particularly for Iran it is more of a national security issue. In the absence of a stable legal framework, a military conflict over the disputed hydrocarbon fields and perhaps trans-Caspian pipelines cannot be downplayed. As new fields are discovered in the future, even the bilateral treaties can become a conflict issue. When the late Turkmen President Saparmurat Niyazov said in 2002 that "the Caspian smells blood” he was pointing out the possibility that territorial spats could one day get out of hand. Let us hope the future will prove him wrong. All Caspian littoral states have been involved in ownership disputes over a small number of oil and gas fields. The most serious ones are between Azerbaijan and Turkmen and between Azerbaijan and Iran. The Russia-Kazakhstan dispute has been managed diplomatically when Presidents of both countries signed a protocol in May 2002 to jointly develop the three fields located on the median line between the two countries. 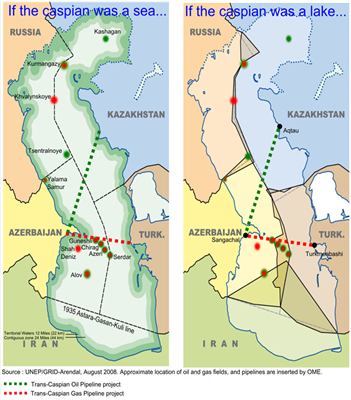 The first dispute between Azerbaijan and Turkmenistan concerns three major offshore fields – Azeri, Chirag and Guneshli. [vi] On 20 September 1994, Azerbaijan and a consortium of foreign oil companies signed the so-called “Contract of the Century” to develop these fields. Turkmenistan, however, claimed that Azeri and (partly) Chirag fields are indeed in Turkmen territorial waters. Turkmenistan even suggested to agree on a long-term leasing arrangement since Azerbaijan has already started work on these fields. [vii] This dispute still continues but the real dispute between Azerbaijan and Turkmenistan is indeed over another field - the Kapaz (known as Serdar in Turkmenistan) field. When the State Oil Company of the Azerbaijan Republic signed an agreement in 1997 with Lukoil and Rosneft for joint exploration and development of the Kapaz oil field,[viii] Turkmenistan strongly reacted and declared that the field belongs to Turkmenistan. The same year, the late Azeri President Heydar Aliyev proposed to develop the field together with Turkmenistan but his offer was rejected. The relations between the two countries deteriorated so badly that the two presidents did not meet for over a decade. In 2007, the new Turkmen President Berdymukhamedov invited Chevron executives to discuss developing the field. In 2009 Azerbaijan repeated its offer to Turkmenistan to develop the field together but received no reply. Instead, in 2009 Turkmen President announced that his government would be taking Azerbaijan to the International Court of Arbitration to resolve this dispute. Another field, Alov (called Alborz in Iran)[ix] is a dispute subject between Azerbaijan and Iran. In July 1998, a Production Sharing Agreement signed with Azerbaijan and a consortium of oil companies gave permission to the consortium to conduct seismic operations on Alov. [x] Iran strongly opposed the decision and asked Azerbaijan to stop activities until the establishment of a legal regime for the Caspian. When this call was ignored, National Iranian Oil Company formed the KEPCO (Khazar Exploration and Production Company) consortium with Shell, Lasmo plc and Weba to conduct similar studies in the same area. Azerbaijan protested that some of the studies were conducted within its territorial borders. The tone between the two states increased until an Iranian warship and two military aircraft threatened two Azeri vessels exploring the field on behalf of BP on 23 July 2001. As a result, BP suspended drilling in the area and the development of the field was frozen. Meanwhile Iran has started its own exploration plans for Alborz. Reportedly, Iran has resumed in November 2015 talks with Brazil’s Petrobras. In 2010 Khazar Exploration & Production Company had reached an agreement with Petrobras on developing two exploration blocks in deep-water Caspian, but international sanctions forced the Brazilian major to leave Iran. There have been talks in Western political and economic circles about trans-Caspian energy pipelines since the mid 1990’s - one transporting Kazakh/Turkmen gas and the other transporting Kazakh oil to Europe via the Caucasus and Turkey. In August 2007 the US Agency for International Development awarded a $1.7 million grant to the SOCAR to conduct a feasibility study on the construction of trans-Caspian oil and natural gas pipelines. Also, during a meeting between Presidents Clinton and Niyazov on 23 April 1998 the US Trade and Development Agency awarded a $750,000 grant to conduct a feasibility study by Enron for a natural gas pipeline from Turkmenistan to Azerbaijan. But nothing concrete has happened until now. Interests and agendas of players inside and outside the region have particularly been reflected in a series of pipeline plans. Pipelines can, in a way, be a tool to build relationships between countries. As is case in the Caspian and Black Sea regions, however, pipelines can become to symbolise political dominance over the countries rather than being just commercial outlets for hydrocarbons. When seen from a geopolitics perspective, pipelines may have a stabilising effect and can prevent wars, but they can the reason for instability, conflict and even war. To which category would a trans-Caspian pipeline fall in? This is hard to guess. A stable and predictable legal environment that preserves corporate confidence in the legal validity of such projects is vital for the realisation of these pipeline projects. Moreover, several of the Caspian littoral states are opposed to trans-Caspian pipelines on environmental grounds, fearing that such pipelines could potentially cause an ecological disaster in the region. The idea of constructing a trans-Caspian oil pipeline goes back to the second half of the 1990s. Clinton administration's 1998 initiative for an East-West trans-Caspian energy transport corridor was foreseeing an Aktau-Baku-Tbilisi-Ceyhan oil export route stretching from Kazakhstan to the eastern Mediterranean. On 16 June 2006 leaders of Azerbaijan and Turkmenistan signed a framework agreement to create a trans-Caspian project for sending Kazakh oil via the BTC. In April 2007 a memorandum was signed to carry oil extracted from Kashagan and Tengiz fields to Sengachal terminal near Baku through the 700 km undersea pipeline between Aktau and Baku. But after so much talk and ink the trans-Caspian oil pipeline project has not been realised due to several reasons, including political and commercial. So far three options have been considered to bring Turkmen gas to the Western markets; by pipeline, via LNG or via CNG. However, the strong Russian opposition to the concept of laying a physical pipe on the Caspian seabed based on environmental and legal grounds has made the pipeline option rather problematic. And the other two options are considered too costly when the transport volume and the distance travelled are considered. In the early 1990s, Turkish and Turkmen leaders suggested the concept of a trans-Caspian Gas Pipeline Project, which would transit Turkmen gas westward to Baku across the Caspian Sea for transhipment further west through Georgia and Turkey. Supported by the US, this pipeline would be linked with the Baku-Tbilisi-Erzurum pipeline and through it to the Nabucco Pipeline. Gas from the Tengiz field in Kazakhstan would also link to the line at Aktau in Kazakhstan, as suggested by the US in 1997. USA and Turkmenistan signed a feasibility study agreement in 1998. Turkey and USA agreed to support the project. In 1999, Turkey and Turkmenistan signed a 30-year agreement to export gas from Turkmenistan to Turkey. In addition, the same year Azerbaijan, Georgia, Turkey and Turkmenistan signed an Intergovernmental Declaration on laying the legal framework of the construction of the trans-Caspian pipeline. Unfortunately, the parties failed to reach a common agreement and negotiations collapsed in 2000 – due to payment and price issues, the lack of a legal framework governing the use of the Caspian Sea, and capacity allocation among Turkmenistan and Azerbaijan. Oppositions from Russia and Iran to such a project had also impacted to the shelving of the project. However, after the Russia-Ukraine gas disputes in January 2006 the project has started to reappear. Turkmenistan signed a memorandum of understanding in April 2008 with the EU to supply gas starting in 2009, presumably through a trans-Caspian pipeline. In December 2008, two Nabucco gas pipeline project partners, OMV and RWE established the Caspian Energy Company to assess options for the building of a trans-Caspian pipeline and to look for partners for a project which would build and operate such a pipeline. When Turkmenistan stressed in a statement in April 2009 (following the Russia-Turkmenistan gas crisis) that it wishes to see “the shortest and most convenient routes” to market developed, hopes were raised again for revitalizing the trans-Caspian gas pipeline. In addition, several favourable developments helped building this feeling: Turkmen gas sales to Russia ceased, sales to Iran reduced, operator of Turkmenistan's Block One fields Petronas took a 15.5% stake in Shah Deniz, high level European Commission officials paid frequent visits to Turkmenistan, and Turkmenistan involved in TAPI pipeline. The latter is significant because it meant the end of Turkmenistan’s long supported policy of not been involved in pipeline projects. Besides, Turkmenistan and Azerbaijan have demonstrated interests to deliver their gas to Southern Gas Corridor. In May 2015, the Ashgabat Declaration[xii] brought Turkey, Turkmenistan, Azerbaijan and the EU together in a statement that recognised the importance of equal and mutually beneficial cooperation in ensuring reliable natural gas supplies from Turkmenistan to Europe but without any serious talks, let alone taking any tangible steps. The legal status and regime of the Caspian Sea was ruled by the Soviet-Iran Treaties of 1921 and 1940 until the breakup of the Soviet Union. Since then it has become a legal uncertainty and a headache, even if the past Treaties are still binding for all Caspian states (including the newly independent states). As far as Caspian Sea’s legal status is concerned, the past Treaties do not provide any specific answer. They only mention that it is a Soviet-Iranian sea. Also, no marine boundaries or delimitation lines in the Caspian Sea between Soviet and Iranian parts are provided in any of the past Treaties. As for its legal regime, the past treaties relate solely to regulation of navigation and fishing but do not address the issue of the seabed sovereignty or delimitation of seabed resources. The whole issue boils down to the question of how to demarcate or share the Sea among the littoral states by taking into account of the past treaties and current realities. Although the littoral states have been discussing for two decades how the problems related to the demarcation (who gets what and how), the issue has not yet been settled. After 43 "going nowhere" sessions of the special working group and a handful of Summits the positions of the countries are very well-known. This situation has blocked many projects including trans-Caspian pipelines and many oil and gas fields situated in areas contested by neighbouring states. When international oil companies entered the region in the early 1990s, their main worry was commercial as well as political risks and challenges they would be faced with. In less than a decade managing these risks has turned out to be only a small part of a risk chain, which is tied to the uncertain legal framework of the Caspian Sea. It is still not clear whether trans-Caspian pipelines will ever be built. If at least one of them is built, USA and the EU will be likely to support the construction as it will boost Western influence and hence may change the balance of power in the region. That is why the Western powers speak out in favour of non-Russia and non-Iranian export outlet for Caspian hydrocarbon resources. While the big powers such as USA/EU, Russia and China will shape the region’s geopolitical future, the regional players including Turkey and Iran will try to advance their interests. Since the players in the region have conflicting interests and priorities, the trans-Caspian pipelines are likely to ignite conflicts of interests and a geopolitical competition between the different players. Political disagreements among the players are inevitable in the region and will surface once their interests and priorities clash. Unless military security in the Caspian basin is ensured, Iran and Russia will delay by any means the process of the resolution of the legal framework. Iran, on the other hand, is likely to delay any agreement on the Caspian Sea legal framework until its relations with the US is put on track. With sanctions being lifted on Iran, it is not yet clear what influence that might have on Tehran's position, though it is likely that Iran, which now has become a competitor, will continue to oppose the construction of any trans-Caspian pipeline. Multidimensional aspects of a legal framework in terms of theoretical and practical basis require the political will of the key players for a consensus. As Vladimir Putin stated in 2002, the future of the Caspian – whether it is a sea of cooperation or a clash of interests – will depend on how the littoral states untangle the tight Caspian knot of problems. Although some argue that a five-way treaty currently seems highly unlikely, there is still hope. The general consensus so far is that the seabed (and the oil and gas resources underneath) should be divided into national sectors and the sea’s surface and water layer should be shared. But how this division may be accomplished still remains a challenge.